What makes these so much fun is that they are a form of both brownies and blondies. Instead of cocoa or melted chocolate for flavor (as is the case with chocolate brownies) or simply brown sugar (typical of blondies), this recipe uses brown sugar and peanut butter. The result is a rich peanut butter flavor and dense texture. 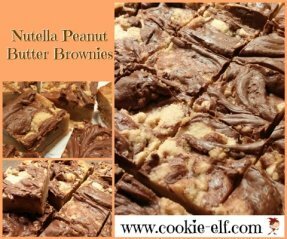 They are topped off, literally, with Nutella (a chocolate spread made from cocoa, hazelnuts, sugar, and additional ingredients, available in grocery stores near the peanut butter) swirled on the surface. 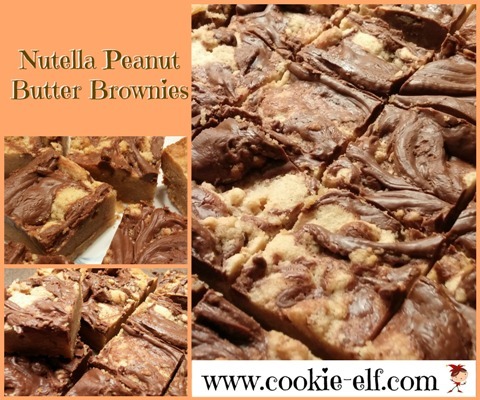 Which makes these a true combination of brownies and blondies. And irresistible. Preheat oven to 350º F. Line an 8 x 8 baking pan with aluminum foil, allowing ends of foil to extend over two sides of the pan. Coat the foil lightly with vegetable spray. In a medium bowl, using an electric mixer on medium speed, combine butter, peanut butter, and brown sugar. Beat until well blended. Add egg and vanilla extract, beating until the mixture is smooth. Add flour gradually, mixing until dough is combined. It will be thick. Drop dollops of cookie dough onto bottom of the prepared baking pan. Press the mixture lightly but not too evenly, leaving crevices for Nutella. Drop teaspoons of Nutella over cookie surfaces. Use a knife to swirl Nutella across the top of the brownies. Bake for 20-25 minutes or until golden brown. Do not over bake. Remove the pan from the oven and allow cookies to cool completely on a wire rack. You may wish to set pan in the refrigerator for an hour to allow brownies to chill, allowing for cleaner cuts. The cookie dough is thicker than Nutella, which means the Nutella will sit on the cookie surface rather than penetrate it. That’s why it is helpful to press the brownie mixture lightly into the pan rather than evenly. Fill in the crevices with Nutella to create a smooth surface. Drop very small dabs of Nutella onto the cookie surface. Smaller amounts are easier to swirl than large globs.